Duration: 13 Nights/14 Days from Kathmandu. Destination: Sagarmatha (Everest/Khumbu) National Park - Everest Base Camp at 5364m. Trek start/end: At Lukla Airport 2840m. Grade: Challenging of High Altitude. Trek style: Room and meals at Teahouse/lodge. Highest elevation: Kala Pattar 5545m. Ethnic group: Majority of the Sherpa community. Villages: Namche, Thame, Khumjung, Phortse, and Pangboche etc. Monasteries: Pema Chholing monastery, Khumjung monastery, Tengboche monastery, and Pangboche monastery. 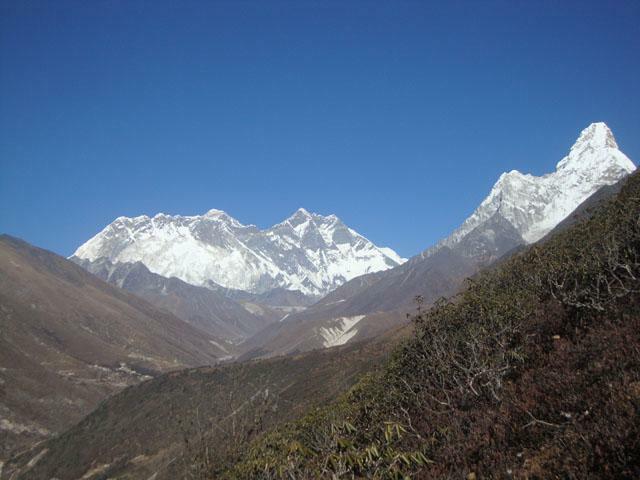 View points: Nangker Tshang 5000m, Chhukung Ri 5550m and Kala Pattar 5545m. Himalayan Scenery : Thamserku, Kusum Kangaru, Kwangde, Tabuche, Ama Dablam, Kangtenga, Island Peak, Peak 38, Ambigachen, Puma Ri, Khumbutse, Nuptse, Lhotse and Everest etc. Lakes: Cho La Tsho 4590m and Imja Tsho 5010m. $1350 Per Person Mt. Everest Views from Kala Pattar. $1350 Per Person Views of Everest and Ama Dablam. 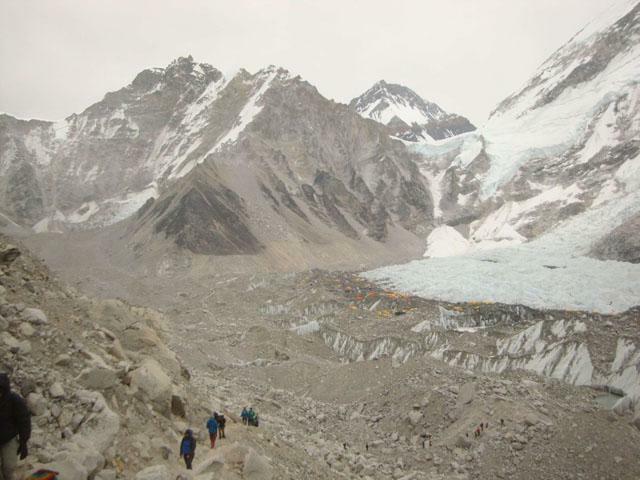 Everest Base Camp Trek is a famous hiking journey in the Himalayas of Nepal. Mt. Everest is situated in the Sagarmatha National Park (Natural Heritage Site). This is locally known as Khumbu valley where we experience the rich culture of the Sherpa people and the most iconic mountain views in the world. The journey begins with the flight to Lukla (Tenzin – Hillary Airport) at elevation 2840m after you spent a day discovering the historic treasures of Kathmandu and trek preparation. Hiking trails are lined with Mani-stones (carving with Buddhist prayers), prayers flags (five different colors), Stupas and ancient monasteries en-route of Everest Base Camp Trek. We take you to the Sherpa villages and explains their unique culture and festivals such as Mani Rimdum and Dumje etc. Sherpa’s has a tale of a Yeti. We follow safe acclimatization rules and also carefully design trek schedule for acclimatization in the high altitude that helps you successfully achieved trip of a lifetime to Everest Base Camp (EBC) at 5364m. We include ascents to the best viewpoints such as Kala Pattar (5545m) to see close up views of Mt. Everest, Lhotse, South Col, Nuptse, Puma Ri, Khumbutse, Khumbu Icefalls, and Khumbu glacier etc. We stop at teahouse that has the room with twin beds, sleeping pad, and pillows. There have to share toilets and washing facilities with teahouse guests. Warm enough sleeping bag is highly recommended for taking with you. We manage International Airport picks up. Please check the cardboard of High Camp Trekking upon arrival in Kathmandu Airport. Our company representative helps you transfer to the Hotel. We give a briefing about things to do in Kathmandu. All includes: Airport picks up, bed and breakfast. Day 02: Trek preparation in Kathmandu. We talk about day by day trek schedule, packing equipment list and obtain hiking passes today. We take to you for a tour of world heritage cultural site Sawayambunath (monkey temple) in the afternoon. Day 03: Kathmandu to Lukla flight and trek to Phakding 2610m/3hrs. After breakfast, we go to the domestic terminal and fly to Lukla takes about half an hour. We see panoramic views of Himalayas from the left window of the Airplane. After landing at Lukla Airport, we take you to the hotel for tea/coffee and introduction with porters who carry your trekking equipment while on the trek. The walk begins from Lukla with views of Mt. Number Himal (6959m) and Kongde Peak (6186m). Leaving Lukla, we go downhill to the village of Chaurikharka through Rhododendrons forest. We follow the path lined of Mani Mantra walls, Stupas and prayers wheels and flags to reach Phakding. We visit Pema Chholing monastery in the afternoon and back to lodge at Phakding where we spend a night. All includes: breakfast. lunch and dinner with tea/coffee. Day 04: Phakding to Namche 3440m/6hrs. We are leaving Phakding after breakfast and follow the Dhudha Koshi valley northwards to reach Manju where checks hiking passes. From here, we go downhill through Rhododendrons forest and cross the bridge to reach Jhorsale where we take lunch. We prepare plenty water for next steep step uphill to Namche through pine and Rhododendron forest. We see Mt. Thamserku, Kusum Kang and the first glimpse of Everest en-route. Namche is the main trade center of the Khumbu region and has a weekly local market on every Saturday selling of fresh foodstuffs brought up from the lower villages. We sleep two nights in Namche. Day 05: An acclimatization day. After breakfast, we get up to Everest View Hotel which has excellent scenery of Everest, Lhotse, Ama Dablam, and Thamserku etc. We enjoy the views of Everest with a cup of tea at the terrace of Hotel. Then, we visit Khumjung village that has Khumjung School (Hillary school), the longest mani mantra wall and ancient monastery with a skull on display, a tale of the Yeti. 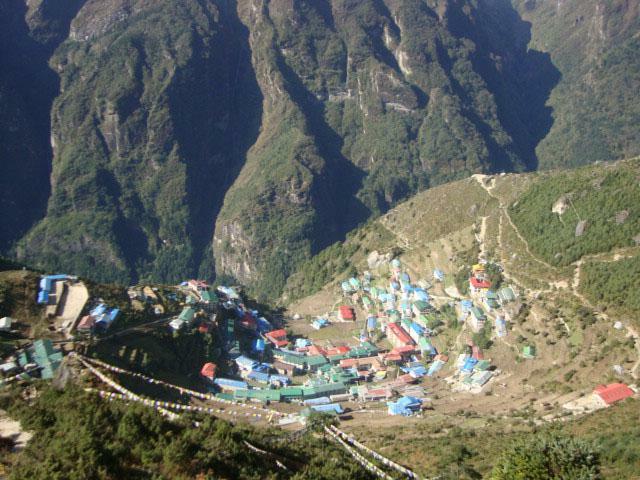 We also visit Khunde village and descend to Namche bypassing Syangbochen Airport. We are hanging around Namche which has trekking gears shops, bakery and coffee shops in the afternoon. We spend a second night in Namche for safe acclimation before we are heading to higher up. Day 06: Namche to Tengboche 3860m/6hrs. We are leaving Namche after breakfast. Today, we are heading to Tengboche. The path is easy to Kyangjuma through the Stupa as a memorial of Tenzin Norgay which has fabulous views of Khumbu valley, Mt. Everest, Lhotse, Ama Dablam, and Thamserku. From Kyangjuma, we go downhill to the Phunki Tenga where we are at the gorge of the Dhuda Koshi River and the army check post. Next steep ascends to Tengboche through pine and Rhododendrons trees. The scared Tengboche monastery is on the top of the hill with views of gigantic peaks in all directions. The monastery is the home of Rimpoche and 30 monks who practice deeply Vajrayana (belief in deep meditation) Buddhism at Tengboche. There is a huge statue of Sakyamuni Buddha and nicely wall painting inside the monastery. The visitors have a sitting place on the right corner at praying hall. We see the footprints of Lama Sange Dorje on solid rock and Mandala of "Wheel of life" in the entrance of the monastery. A 9 days long famous Mani Rimdum Festival (famous monks dance with musk) celebrates at Tengboche monastery in the full moon of October. The sunset over Mt. Everest and monks chanting at the monastery do not be missed from Tengboche. Day 07: Tengboche to Dingboche 4410m/5hrs. After breakfast, we are heading downhill through Rhododendrons forest to reach Dingboche where has nunnery monster and several nice lodges with views of Mt. Everest. We are crossing the Imaja Khola (upstream) and get up to the village of Pangboche which is the permanent settlement in the Khumbu region. 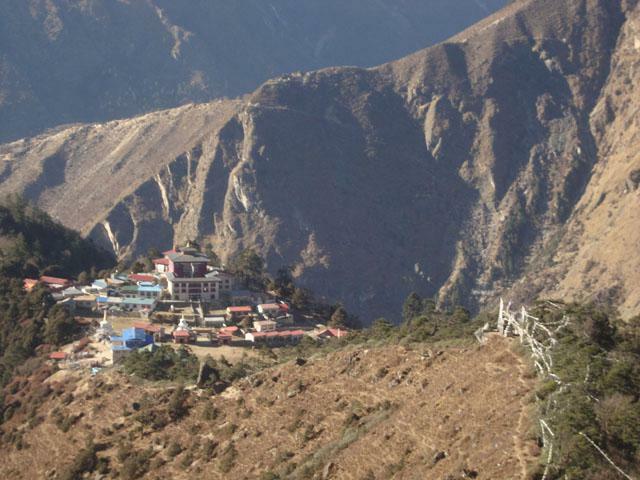 Upper Pangboche has the oldest monastery in the Khumbu valley. A view of the Mountain Ama Dablam (6814m) is so close from here. We ascend along the valley to reach Somare where we take lunch. On next, we are heading above tree lines but pleasant walk through wide trails to reach Dingboche where we sleep two nights. Day 08: An acclimatization day in Dingboche. As an idea of safe acclimatization before we are pushing to Everest Base Camp, we hike up to Nangker Tshang Peak (5000m) which has spectacular views of Mt. Ama Dablam, Lhotse, Makalu, Cho Oyu, Island Peak, Tabuche, Kangtenga, and Thamserku and retrace back steps to Dingboche for lunch. It is the highest place where barley is grown in the summer. We have free time in the afternoon. Day 09: Dingboche to Thukla 4620m/3hrs. After breakfast, we have a short steep uphill to stupa on the ridge which has views of Lhotse, Ama Dablam, Mt. Makalu and Island Peak. On next, we walk through the valley to reach Thukla. We do an acclimatization hiking to Cho La Tsho (Lake) in the afternoon and back to Thukla where we spend a night. Day 10: Thukla to Lobuche 4910m/3-4hrs. We leave Thukla after breakfast. From here, we ascend uphill to reach Thukla Pass where has a line of memorials of the famous mountaineers who died on Mt. Everest. It is a memorable place of trekkers because of the beautiful scenery around it and memorials of the famous mountaineers. Then, we go through a valley to Lobuche with a beautiful panoramic of the gigantic peaks lying on the end of Khumbu valley bordering Tibet. We tour to Italian Pyramid after lunch and back to Lobuche where we spend a night. Day 11: Lobuche to Everest Base Camp to Gorak Shep 5140m/7hrs. Today, we are heading to Everest Base Camp which our main goal of the trek. We ascend the Khumbu glacier through rocky trail northward to reach Gorak Shep where we take lunch. We do a day hike to Everest Base Camp through Rocky trail along the side of Khumbu glacier. We spend an hour at Everest Base Camp which is the world’s famous place as an achievement of a lifetime journey. Khumbu Icefalls and glacier are the main attraction of the Everest Base Camp which we touch and retrace back steps to Gorak Shep which is the highest elevation for sleeping during the trek. Day 12: Gorak Shep to Kala Pattar view point and descend to Pheriche 4200m/6hrs. We ascend steep uphill to get up Kala Pattar 5545m viewpoint which is the highest elevation of the trek and it has 360-degree views of Everest panorama including Mt. Everest, Lhotse, Nuptse, Puma Ri, Lingtren, Khumbtse, Ama Dablam, Thamserku, Tabouche Peak, Khumbu Icefalls, Khumbu glaciers, and Everest Base Camp. This is a bit tough but even scenic hike than Everest Base Camp yesterday. We back to Gorak Shep for breakfast and retrace the back steps to Pheriche through passing Lobuche and Thukla. Day 13: Pheriche to Phortse 3860m/6hrs. We are leaving Pheriche after breakfast. We descend through the valley to reach Upper Pangboche where has the oldest monastery in the Khumbu region. We visit the monastery and enjoy the close-up views of Ama Dablam in the Upper Pangboche. After lunch, we are heading to Phortse through the less crowded trail of trekkers. We could see Pheasant (the national bird of Nepal), Musk deer and Himalayan Thar (wild mountain goats) en-route. Day 14: Phortse to Namche 3440m/5hrs. Leaving Phortse, we are descending to Phortse Thanga and climb up to the ridge of Mong La 4075m that is the birthplace of Lama Sange Dorje. There are Mani walls around the oldest Stupas. We drink a cup of tea and enjoying the views of Ama Dablam and Khumbu valley. From here, we descend steep downhill to reach Kyangjuma where we take lunch. Now, we are on the main trail and retrace back steps to Namche. Day 15: Namche to Lukla 2840m/7hrs. Today, we are descending to Lukla from Namche which is the last day of the trek. We descend through pine and Rhododendrons trees to reach Top Danda which has the last chance to see the Mt. Everest. Again, we continue descending through the high bridge to reach Jhorsale. On next, we climb up to Manju where we are exiting from Sagarmatha National Park (natural world heritage site). From here, we continue walking along the Dhudha Koshi green valley to reach Phakding where we have lunch. We walk back to Lukla through villages and gradual uphill at the end of the trek. Day 16: Lakla to Kathmandu flight in the morning. We fly back to Kathmandu in the morning and check in Hotel. We have free time in the afternoon. All includes: Breakfast and domestic Airport transfer. Day 17: Free day in Kathmandu (buffer day for Lukla flight). We do a tour to world heritage sites of Boudhanath Stupa and Pashupatinath Temple today. Day 18: International Airport departure. Our company representative drops you in the Kathmandu Airport on time flight back to home. Note:- Request a custom itinerary. The itinerary can be changed for an interesting side trip and an additional acclimatization day if needed while on the trek. 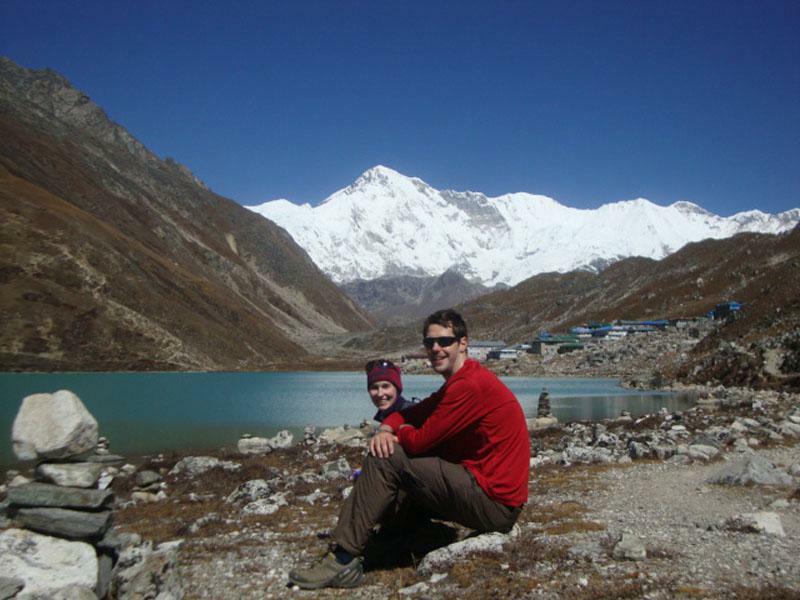 Do you have any questions regarding Everest Base Camp Trek? Or would you like to see how it can be customized to your needs? Please DM us. The following cost and date are for per person for online booking. If the trek departure dates are not matched for you, please DM us and we will happily customize your trip on the date that you need. Two nights accommodation (Standard single or twin bed room with breakfast) at 2** Hotel in Kathmandu. Note:- The accommodation in Kathmandu can arrange/book according to client choice Hotel type. The clients have to pay differences if needed. Sagarmatha (Everest) National Park hiking passes. Teahouse meals for clients: 14 Breakfasts, 13 Lunces and 13 Dinners with tea/coffee while on trek. Meals can be selected from menu and will have enough daily. Fresh or can juice, fresh fruit, snack, buscuit, coca, fatan, sprite, beer, whisky, boil and mineral (bottle) water during the trekking days. Expenses for personal nature: Hot showers, laundry, donations, museum entry fee, movie/flim watching, postage, battery charge, telephone and email/Interntet etc. Horse/Yak renting while on trek. Sightseeing in Kathmandu, Bhaktapur and Patan etc. Note:- tour guide and transpotration can be arranged on client's on request. International flights and Nepal tourist visa (you can obtain tourist visa up on arrival in Kathmandu Airport. Please read carefully cost includes and does not include above. All the meals are included with tea/coffee while on the trek. We do not include drinking water or boil water which you can buy at teahouse; this is $1 to 3 per liter. You can take water purified tablets or Seripen for the cheaper solution. Wi-Fi, battery charge and hot showers are not included. Wi-Fi is $20 for 10GB and $30 for 20GB for using unlimited service per card. Battery charge is $3 to 10 for a full charge per device (you can take power bank for a cheaper solution). The gas shower is USD3 to 7 per head. In case Lukla flight is canceled due to weather r condition, you are responsible for extra Hotel nights and meals in Kathmandu and Lukla for any extra days. 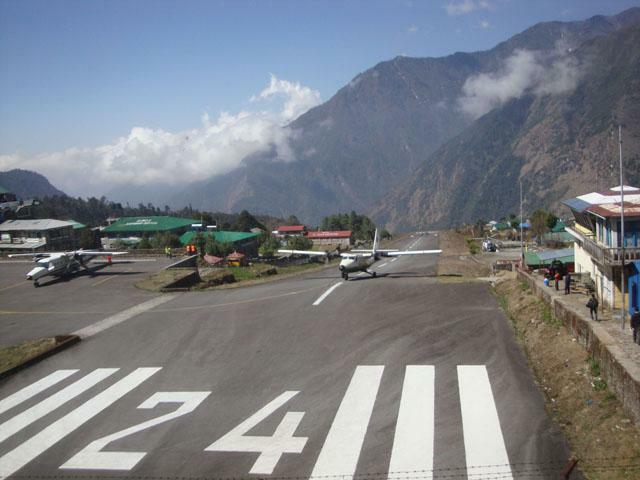 Do not require extra payment for rescheduling Lukla flight due to canceling of weather. But, there can be less priority for flight cancel passengers on the following day. If there are unexpected circumstances such as flight cancellation due to weather condition, we offer you an alternative trip. Strong, comfortable hiking boot. Four pairs socks. Sandals or sports shoes. Two pairs trousers, a fleece and down jacket, three T-shirts, two drip-dry T-shirts, long underwear, a woolen/fleece hat, glove, water/windproof jacket and trouser, Sunglass, lip balm, Sun scream (50+), Sun hat, a light scarf, soap/shampoo and trekking towels etc. A strong and warm sleeping bag (-20 degree centigrade). Water purifier tablets, 2L water bottle, hiking poles, medical kit and torch light with spare batteries etc. Plastic bag for waste and toilet papers. A duffel bag or rucksack large enough (65 to 75L) size. Note: If you do not have any idea for trekking medicine, we will be sent some information upon trip booking. We have down jacket and sleeping bag renting felicities for our clients. It is cost USD1 per sleeping bag and down jacket per day. We are registered on Department of Nepal Tourism and have authority to operate trek and climb in the Himalayas of Nepal. We are the taxpayer to Nepal Govt. 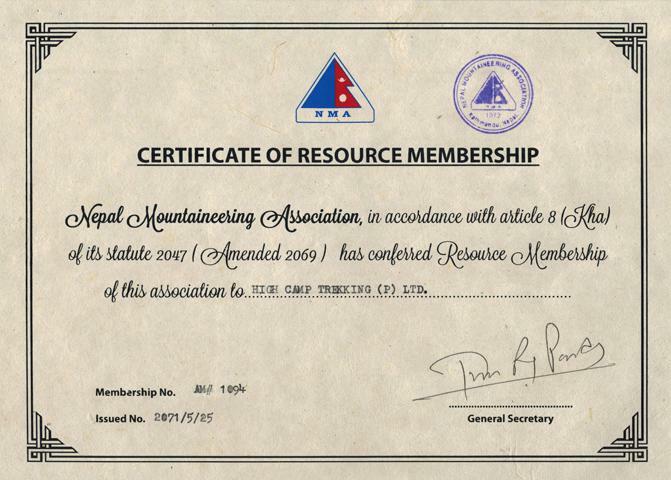 We are the member of Trekking Agencies of Association of Nepal (TAAN) and Nepal Mountaineering Association (NMA). We are healthy and up to date a local trekking agency based in Kathmandu/Nepal. You can book the trip on the minimal advance in money and can pay the balance rest of the trip amount upon arrival in Kathmandu/Nepal. Please read carefully the terms and condition of High Camp Trekking to book a package trip. Once you agreed with term and condition; payment is an unavoidable part of the agreement. The following are different methods of trip booking advance payments for your convince. Note:- please pay any amount charged to you by your bank for transferring the booking advance in money to us. 2) If you like to transfer the deposit by Western Union, MoneyGram and IME, you can use our company owner/manager name: Norsang Lama. Once you booked the trip with us, trip departure is guaranteed. In case you want to postpone trip departure date, do not need to pay an extra fee. We never let you down after we received payment for trip running. We do hard work for every single dollar. We organize private and group joining basis trip. Our package is with all-inclusive prices (no hidden cost). We customize trip itinerary based on your interest, holiday’s length and activities as you need. Lets us know your holidays' length.